Well, I’m sorry to break it to you — but plenty. You’ve invested millions into the product, marketing, and the wider business. To hit the numbers that you (and probably your investors) need to see, success outside your domestic market isn’t optional — it’s essential. And that’s why a successful programme of localisation is so important. Internationalisation is the process of designing and developing your product so that it can be localised and translated effectively further down the line. It’s step one, and should ideally be ‘baked in’ from the moment the first line of code is written. In software terms, that usually means ensuring that your build can support different currencies, date and time formats, right to left text direction, and other international elements. Leaving lots of space in the UI for text expansion in different languages will also reduce costs and delays further down the line. In short, if these core elements aren’t in place — real localisation can’t start. That’s going to slow you down and cost you more money to fix. On the subject of speed — keep your expectations realistic and start thinking about localisation early. Throwing additional resources at a localisation project can speed it up, but if the strategy and execution is rushed the results are likely to be disappointing. It’s better to delay launch than go to market with a poorly localised product. Bad localisation doesn’t provide positive returns in the long term — it results in high churn rates and excessive support costs, and in the worst cases can be the root cause of failure in new markets. A costly mistake that’s best avoided. Whilst the two terms tend to be used interchangeably, there’s a big difference between localisation and translation. The latter deals with words alone — a simple translation from one language to another. Localisation is a more holistic concept, digging deeper into cultural adaptation, context, and the use of sophisticated software engineering to ensure your core product looks, feels, and performs like it was built especially for a particular language user. Mixing the two up can have a serious impact on the user experience and the integrity of your product. 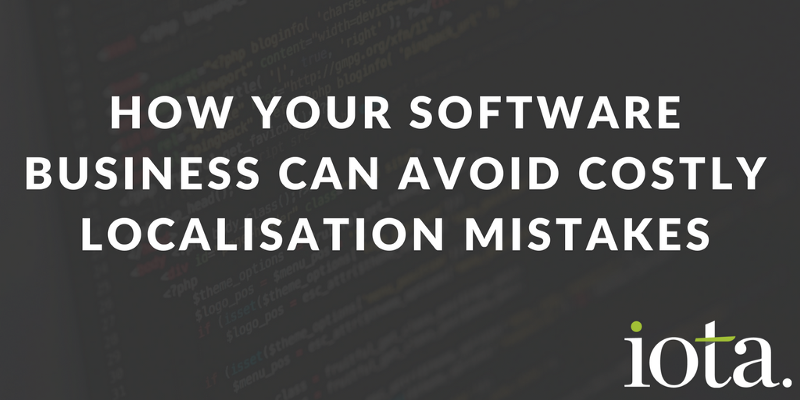 If you’re serious about succeeding internationally and you’ve invested heavily in getting your core software right, a simple translation isn’t going to help you build a robust global business in the long term. You’ve probably invested a significant sum developing your core product, and now you’re planning to spend a thousand getting a few UI strings translated for the global market? Quality localisation should be seen as a revenue driver, not as a cost. Without it, you’re not going to see meaningful international growth. Building an international business requires a financial commitment — to undertake the initial localisation work, and to keep up to date with ongoing updates. Perhaps the best way to review your budget is to consider what the cost of failed market entry would be, and work backwards from there. Businesses succeed and fail based on the relationships they forge. Localisation is no different, and if you choose the wrong partner it can have serious consequences for your international growth. ‘Wrong’ in this context will usually mean one that isn’t aligned with your culture, values, and day-to-day needs. Many early and mid-stage companies make the mistake of choosing a provider based on their size (is bigger better?) or price. A mistake at this stage can slow you down, lock you into a process that can’t scale with you, or come with a raft of hidden costs that don’t show themselves until you’re much further down the line. Take a look at this article if you need some help in choosing the right partner for your business. If you’re serious about growing internationally, and really don’t want to screw it up — drop me an email, or give me a call on +44 207 096 0390. Iota work with some of the fastest-growing and most innovative software companies across North America and Europe. In many cases they’ve grown to be the leaders in their field, and we can help you do the same.